PSSI Global Services is coming into an extraordinary stretch of high-profile transmission services all over the world. March Madness, indeed! Whenever we have just one golf tournament on our schedule, you know it’s a big one. Kevin Spangler and Chris Golden have been tag-teaming long days for over a week now at the 46th Annual PGA Tour Players Championship at TPC Sawgrass in Ponte Vedra, FL. As of this writing, Tommy Fleetwood is atop the leaderboard, but it’s anyone’s tournament going into the final rounds. Check out our coverage on the Golf Channel to see who will win what may be the biggest purse ever seen for a single tournament. The stakes are high! Gearing up for the PPV at AT&T Stadium. Speaking of high stakes, when Fox and Premier Boxing Champions announced their first-ever pay-per-view boxing event, you can bet their first and only call for transmission and event management services was to Strategic Television president, Matt Bridges. Matt assembled project managers Victor Verno and Michael Hollander to begin developing the domestic and international transmission routing, while director of project engineering, Tracy Michaels, worked with Fox’s production team to build the transmission plan for multiple, redundant pathways via satellite and fiber. 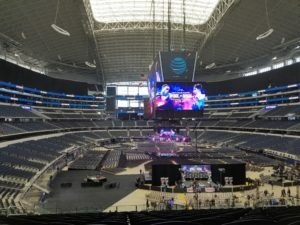 Months of planning will culminate in Saturday night’s PPV at AT&T Stadium in Arlington, TX, where IBF Welterweight Champion, Errol Spence, JR will defend his title against four-division world champion and current WBC Lightweight Champion, Mikey Garcia. John May will be in the CK48 mobile teleport with domestic and international transmission pathways out of each antenna, while Ron Ford is a secondary domestic PPV pathway in his K26 truck. Senior engineer Mike Lemieux will encode and multiplex multiple feeds via fiber. The PSSI International Teleport will provide QC and turnaround services for international delivery. As if that weren’t enough, Mark Huss will be ringside providing commentary services to international broadcasters. Our team has been there all week, and will ensure all the weigh-ins, press conferences, and undercards find their way to boxing fans around the world. Only PSSI Global Services has the engineering prowess, project management experience, and cutting-edge resources to pull off a huge event like this. Nice work out there, guys! Can anybody see Mark Huss ringside? And while it’s a big one, the PBC on Fox PPV isn’t the only boxing on our schedule this weekend. Blake Blomstrom (with a helping hand from Dennis Smith) has C42 all set up for Friday night boxing at Temple University’s Liacouras Center in Philadelphia, PA. IBF Junior Lightweight Champion Tevon Farmer defends his title against Jono Carroll in the main event. This fight, along with all the undercards, will air on the DAZN app to boxing fans around the world. 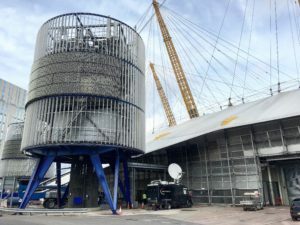 We’re back across the pond at the O2 Arena in London, working alongside our friends at Links Broadcast and UFC to provide extensive transmission services for UFC Fight Night 147. Highlights include Darren Till taking on Jorge Masvidal in a welterweight matchup, Leon Edwards taking on Gunnar Nelson, and Volkan Oezdemir in a light heavyweight bout against Dominick Reyes. 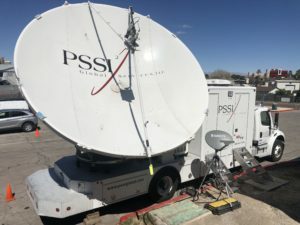 Senior engineer Jim Flowers and project manager Garrett Hunt are there to ensure a clean transmission to MMA fans around the world, and the PSSI International Teleport will handle domestic distribution as well as turns to Latin America. The AAF football season keeps rolling along, and PSSI Global Services continues to be an integral part of each game. Steve Chaisson and Todd Harvey are all set up in the C15 truck at Rice Eccles Stadium in Salt Lake City, UT, where the Memphis Express take on the Salt Lake Stallions on Saturday night. Steve and Todd will be providing an at-home transmission of the game that will be produced for broadcast at Sneaky Big Studios in Scottsdale, AZ. They will also provide data bandwidth over satellite for the production crew’s communications between SLC and Scottsdale. As always, PSSI International Teleport is the hub of all this transmission activity, linked via satellite to SLC and via AT&T GVS fiber to Sneaky Big. Down in Scottsdale, John Bright’s back on K34 to be the EIC for the remotely produced pre-game and halftime shows for all four AAF games. John will also have backup paths for several games coming out of the K34’s antenna to NFL Network and Turner. Inside the building, Paul Blomstrom will occupy his QC station, which includes a stack of decoders, as the remotes from around the country reach Sneaky Big’s production team. C32 at Spectrum Stadium in Orlando. Craig Henry’s getting in on the AAF action for the first time this season. Craig and C32 are at the Spectrum Stadium at the University of Central Florida in Orlando for Saturday’s game between the Arizona Hotshots and Steve Spurrier’s Orlando Apollos. Back out west, Wes Hill and Chris Hovden are in the CK35 mobile teleport at the SDCCU Stadium in San Diego, CA, providing another at-home transmission for the game between the Birmingham Iron and the San Diego Fleet. Here again PIT figures prominently, ingesting the multiplexed game feeds and passing along to Paul at Sneaky Big. Exciting stuff! We had a little NFL action earlier in the week. 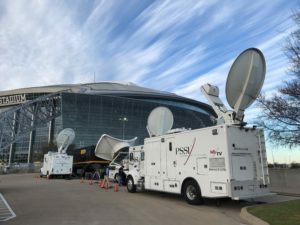 Before heading down to Dallas for the PPV, Mike Lemieux found himself in Norman, OK providing extensive transmission and comms services for NFL Network’s coverage of Kyler Murray’s pro day, as the Heisman-winning quarterback gets ready for the NFL draft. Mike heads to Columbus, OH next week for pro day at the Ohio State University. We have plenty of the other kind of football, too. More Concacaf Champions League soccer this past week. Benny Griffis and the C31 were at Mercedez-Benz Stadium in Atlanta, GA on Wednesday when Monterrey took on Atlanta United and lost 0-1. Dave Brin and the Frontline truck were at Children’s Mercy Park in Kansas City, MO for more CONCACAF Champions League action, as the Sporting KC defended their home field against the Independiente and won 3-0. USA! USA! USA! And how about a little baseball? Brian Blomstrom and the NT25 truck will be at Camelback Ranch Stadium in Phoenix, AZ on Friday for more MLB Spring Training action. It’s the Cubs versus the White Sox! It’s also time for another half-marathon in NYC! It’s the 2019 United Airlines NYC Half-Marathon, and we are working with our partners at IMG to provide data and transmission services all along the race route. 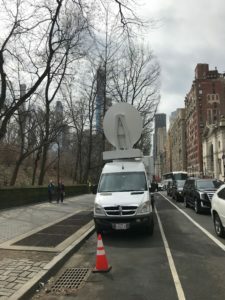 Mati Kerpen has the newly upgraded NT34 sprinter parked and pointed in Central Park West, where he will be providing IP transmission services for the race’s broadcast on multiple social media platforms. In partnership with our friends at Nextologies, Mati will be delivering exciting race content to Twitter, Facebook, ESPN+, and more. Mati is also prepared to provide a satellite path in the event of an internet outage – yet another example of the multi-modal, blended transmission capabilities we have to offer our customers. Big weekend of racing, as we kick off another season of NASCAR’s IMSA WeatherTech SportsCar Championship. IMSA veterans Rick Ball and Justin Roszak are at the Sebring International Raceway providing not one, not two, but 32 video paths and hundreds of audios back to Charlotte for full production. Things are a little different this year. Firstly, the PSSI International Teleport is proud to be the primary teleport for all NASCAR services this season, including IMSA and the Cup Series. Secondly, we have a newly installed Media Links shelf in our C12 truck, which means we are a mobile POP for AT&T fiber services at race tracks (and other venues) across the country. Rick and Justin can provide extensive at-home transmissions via satellite and fiber, providing our friends at NASCAR with the absolute pinnacle of multi-modal transmission services. It’s an exciting opening weekend for us, to be sure! The C27 mobile teleport has been doing the blended satellite and fiber service for NASCAR for quite some time now. This weekend we’re at the Auto Club Speedway in Fontana, CA for the Monster Energy NASCAR Cup Series Auto Club 400 on Sunday. NASCAR mainstay, Kyle Meyer is in the truck with Larry Sheets, who was the first engineer in the C27, which we designed and built for NASCAR several years ago. Nice to have you back on the circuit, Larry! We’re also doing yet another series of races for NASCAR: the K&N Pro Series East and West. This week is the third annual Performance Plus 300, and Benny Griffis will be at Myrtle Beach Speedway on Saturday to uplink this exciting stock car race. Plenty more to come throughout the summer. Can you believe it’s election time already? PSSI News Group’s veteran engineers are already on the road covering various announcements and rallies across the country. Scott Garber was down in South Carolina for a Bernie Sanders rally this week, while Charlie Neiswenter and Steve Mills covered Beto O’Rourke events in El Paso and Iowa. This is going to be one hell of an election season, and our News Group team is well prepared to provide wall-to-wall coverage around the country for our friends and partners at CNN. Hold onto your hats! After all that, we still haven’t talked about basketball! It’s March Madness time, and we are about to get slammed with hoops transmissions around the country. Steve Hagerty and the K18 truck were at Cotterell Court at Colgate University in Hamilton, NY on Wednesday for the Patriot League Men’s Championship, as the Bucknell Bison fell to the Colgate Raiders. Mr. Hagerty will head to Columbus, OH next week for the first round of the NCAA tournament. Rick Varney and the C45 are all set up at the University of Vermont’s Patrick Gym in Burlington, where the America East Championship will take place on Saturday. Tune into ESPN to watch the UMBC Retrievers take on the Vermont Catamounts. C49’s large aperture antenna at the Mountain West tourney. Joe Cox and the C49 truck have been at the Thomas & Mack Arena in Las Vegas, NV all week for CBS’s coverage of the Mountain West tournament. The championship game is on Saturday. More hoops in Vegas this weekend: Brian Blomstrom will be at the WAC Championship at the Orleans Arena on Saturday. Catch both the men’s and women’s finals on the ESPN networks. 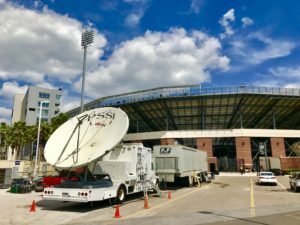 Steve Toth and the K38 truck were at the North Charleston Coliseum in Charleston, SC on Tuesday for the CAA men’s semifinals. The Northeastern Huskies beat the top-seeded Hofstra Pride to take the title. Steve’s taking the weekend off before heading up to Columbia, SC for some first round action in the NCAA Tournament. Dennis Smith and the NT21 will be at the Sojka Pavilion at Bucknell University on Sunday for the Patriot League Women’s Championship, as the #1 Bucknell Bison host the American Eagles. It’s Selection Sunday on CBS this weekend, and we’ll have trucks and engineers at Virginia Tech and Gonzaga to capture the excitement (or heartbreak) when the tournament brackets are revealed. Dave Buckman’s heading down to Blacksburg, VA, and David Meyer’s on his way to Spokane to get these live reaction shots from teams who are on their way to the Big Dance. So much more to come next week as we begin our NCAA Tournament coverage across the country. It’s going to be a wild few weeks for our teams in the field and in the offices as we prepare for multiple days of hoops action. Special thanks to senior project managers Mike Reidy and Eric Storlie – as well as our logistics teams – for banging out pages of transmission orders and booking hotels from coast-to-coast to make sure our engineers in the field have everything they need for a successful March Madness season. John Jennings, who has become PSSI’s resident expert on youth pop culture, went straight from the Bachelor finale to the iHeart Radio Music Awards at the Microsoft Theater, which aired live on Thursday night. From Garth Brooks to Ariana Grande, John transmitted all the great performances and speeches to music fans around the world. What a lineup! None of us have really had much of a chance to catch our breath, and there’s so much more to come on our schedules. Thank you to all of our customers, vendors, and partners for keeping us on our toes!